It might be an engine/crankcase vent tube? These were common before EPA regs required engines to be vented in a way that did not discharge into the atmosphere (typically into the intake system where the fumes were burned). A photo would be helpful for us to ID it. Oh yes, Robin. Once the seats were out it opened right up. It will be fun playing with floor plans so we can find just the one that will suite us. Ursa, I hear ya. Luckily our bus came with some really nice tires. I am sure there is some service work that could be done, but we are not planning anymore long trips at this time. I do still have all the service records from the school that owned it, but they are still back in Ohio. Next trip home I will go through them to see what has been done. Brad I did mean to take a photo of that pipe. I will get it on Thursday after I get off work. Here is the photo of that tube. Exhaust smoke comes out of it while the engine is running. Well I am a few days late on updating everyone and I am sorry for that. Here is an update from Saturday afternoon. 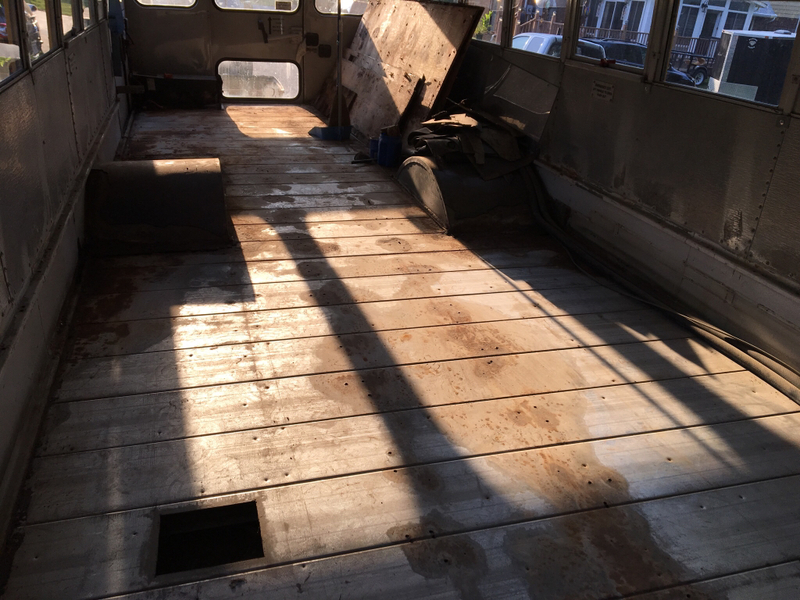 We were able to pull the wheel chair ramp and floors out! With the help of two coworkers, and a floor jack we were able to rip up all of the wood flooring and pull all of the nails out. It got pretty dusty in there as the day went on. The wood was pretty rotted, so it ripped through most of the nails in the floor. Then we just went behind and pulled all of the nails out. 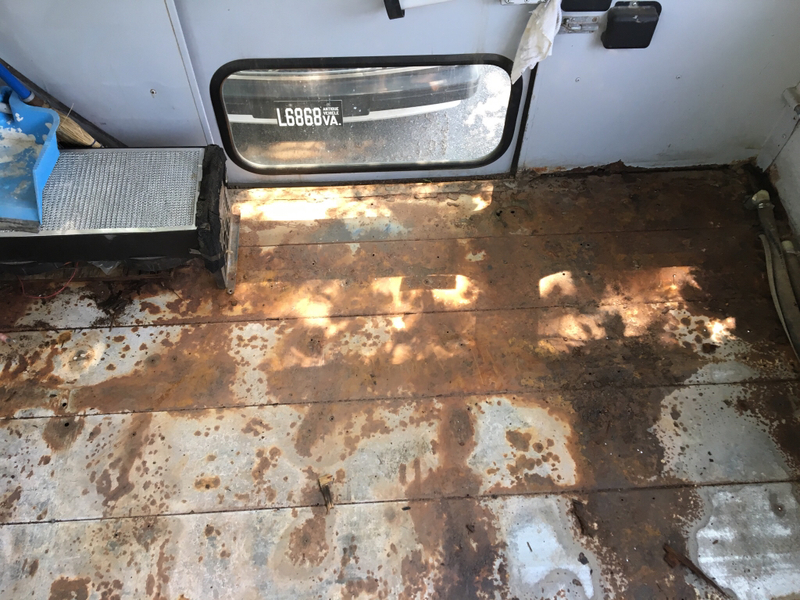 The floor has some rusty areas where I will absolutely need to patch in new metal. I wasn't expecting it to be as bad as it is, but I will be learning the art of welding for this project and this should give me plenty of practice. We swept it up and rested. It was very hot here in Norfolk on Saturday. Monday I drove to the dump to get rid of the plywood, and then I went back to the scales to see how much weight we lost. By taking out seats, wheel chair ramp, and floors we lost a lot of weight. Repairing the floor should be next. I am trying to source a welder and locate some rust converter. The floor and underbody will both need some attention before wthe can cover it up. I will keep you guys updated as I can. Also, I may need to talk to an admin to get my post moved to the conversion. Thread. Looks like a crankcase vent tube to me. Basically, any gasses that make it past the cylinder rings when the engine is running would build up pressure inside the engine, this tube vents them. At some point the EPA said this was unacceptable and these vents had to circulate into the intake system (and be burned in the engine). The more smoke you see here is likely due to more blow-by past the rings. A little is normal. A lot means the rings are getting worn. At some point you may get a little oil dripping from this tube as well (normal with age). The use of the floor jack was brilliant! Have not seen that approach before but I'm betting it will get copied. And have fun welding. It is a talent that will be a huge advantage throughout your build. As soon as we could get he jack in there. It would pull the whole sheet up in a few pumps. I was far easier on knees and backs.